STAR TRACE Screen Separator is a unique particle size gradable separator designed for greater capacity per meter square of screening area & over size material discharge with relatively much less percentage fines than other screening machines.Our company has been a leader in manufacturing and supplying a vast variety of screen separator to various industries across the country. Star Trace Pvt. Ltd. is a prominent vibrating screening/Screen Separation/Screen Separator/machines manufacturers and suppliers of magnet and vibratory/ Vibro gyratory/ Vibro rotory/ Vibro circular vibrating equipments/machines like Screen Separation machines /gyratory screen separator used in various industrial applications.for these rotory/circular screening , We Manufacturers and Suppliers of screening/Separation equipments by an iso 9001-2008 company having dun & brand street registered. We Manufacturers , exporters and Suppliers of magnetic/ vibratory/gyratory/vibrating equipments/Separator such as Magnet Chip Conveyor Separator, Vibrating Screen Separator, Vibro Gyratory separation, Vibro Rotory separation, Vibro Circular Separation, Rotory vibratory machine, Circular vibratory screen, vibrating tables, vibratory motors, rotory circular vibrating machines for screening/ Separation machines and so on. Specialized in fabrication of Vibro gyratory/ Vibro rotory/ Vibro circular screen separator. 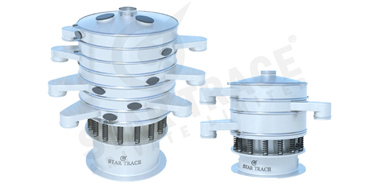 STAR TRACE Gyratory Screen Separator is a unique particle size gradable separator designed for greater capacity per meter square of screening area & over size material discharge with relatively much less percentage fines than other screening machines. Our company has been a leader in manufacturing and supplying a vast variety of screen separator to various industries across the country. We offer horizontal screen separator and circular screen separator which come with many special features. Our screen separator is known for their high performance, innovative designs, and affordable prices making them extremely popular among customers. The motivation is through an unbalanced motor with a double extended shaft, fitted at both ends with eccentric weights .The top weight on the motor shaft rotates in a plane close to the center of the mass of assembly. Rotation of the top eccentric weights creates vibration in the horizontal plane, which causes material to move across the screen cloth to periphery increasing the horizontal throw, causing oversize material to discharge at a faster rate. The bottom eccentric weight rotates below the center of mass creating tilt on the screen giving vibration in vertical and tangential plane. Increasing the vertical component of motion, this promotes turnover of material on the screen separator surface helping maximum quantity of under-size material to pass through the screen separator. Rugged Springs placed over the circular motor base amplifies the vibration. STAR TRACE Gyratory Vibro Screen Separator/vibrating Screen Separation/gyratory vibrating Separator /vibratory/ vibrating rotory circular screen/Screen Separator,machines is a unique vibratory equipments/Separator particle size gradable Vibro separators/machines designed for greater capacity per meter square of screening area & over size material discharge with relatively much less percentage fines than other screening machines. We are Manufacturers in these vibrating machines for last 25 years.we are having 6 factories in chennai,India. STAR TRACE Vibro Screen Separator is a unique particle size gradable separator designed for greater capacity per meter square of screening area & over size material discharge with relatively much less percentage fines than other screening machines. We are one of the leading manufacturers, exporters and Suppliers of , Vibro Gyratory separation, Rotory/ Circular/ Gyratory vibratory Screening Equipments. Cosmetic For removing foreign particles from powders. Foods recovery of rice from hulls, coffee beans from chaff, and tea from bags. Precise division of a dry material into sized fractions. Tea Grading of CTC and Orthodox tea upto 8 grades. Food Coffee powder, ground coffee, dried milk, sugar, salts, spices, cashew nuts, flour, maida, dehydrated onion powder. Dewatering and removal of solid particles from Liquid medium. Paper & Pulp Screening of adhesives, Starch solutions, Paper coatings and Black Liquor. Removal of Pulp and other contaminants from clean & back water. Sizing, scalping of wood chips without any clogging problem. Paints and Pigments Removal of foreign particles from liquid medium.